THIS IS AN AMAZING BUILD IN BRAND NEW CONDITION!!!! EVERY NUT AND BOLT HAS BEEN UPGRADED!!!! THIS IS A TRUE FRAME OFF RESTORATION!!!! new drive train including a Currie Enterprises High 9 3rd member and narrowed Ford 9 inch rear axel!!! complete. Has great oil pressure at idle and when hot. OFF NUT AND BOLT RESTORATION!!!! Fresh rebuilt Dana 20 with 3:1 gears and twin sticks. flaming river steering column and steering shaft. 4 inch lift with Mountain Offroad buggy spring kit on front. Professionally Installed ALPINE stereo with 1600 watt ALPINE PDX-V9 5-CHANNEL Amplifier. ALPINE Bluetooth Receiver with all auxiliary inputs, Sirius XM satellite antenna installed with free trial is still activated. ALPINE Type R Speakers front and rear. Custom built enclosure for rear speakers and 10 inch Type R Thin Line Sub Woofer under the rear seat. High end $9000 custom paint job!!!!! MANY HOURS AND MODIFICATIONS TO LIST!!!! 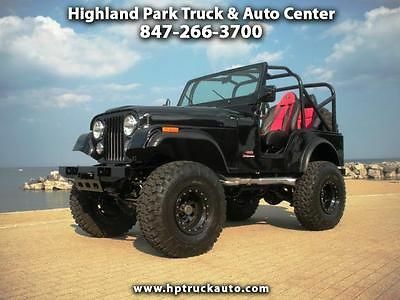 THIS IS A BETTER THAN NEW 1980 CJ-5!!!! NEVER BEEN SHOWN OR SEEN ANYWHERE! THE QUALITY OF THIS BUILD RANKS IN THE TOP .01 PERCENT OF CUSTOM CJ JEEPS! THERE ARE VERY FEW CJ'S IN THE ENTIRE WORLD AS NICE AS THIS!!!! We accept cash, cashiers-check, and certified funds. A $400 non-refundable deposit is due within 24 hours of the end of auction. The Successful "winning" bidder must contact us within 24 hours after the auction has ended to verify purchase and make arrangements to complete the transaction. Within (5) business days of the end of auction, full payment must be received either by cash payment, cashiers-check, bank wire transfer or certified funds. If funds are not received, and an alternate arrangement has not been made, the vehicle can and will be made available to other potential buyers on a first-come, first-serve basis. Please understand that it is the Buyer’s responsibility to arrange shipping. We are NOT the shipping company. Should you need assistance in locating a shipping service, please let us know! We aim to recommend only quality vendors. All vehicles are sold "as-is" and without warranty. Some vehicles will have factory warranty remaining (will be stated in our description). Online Bidders are entering into a legal and binding contract to purchase the vehicle described above. If you do not intend to purchase this item, please DO NOT BID! We reserve the right to cancel bids and/or our auction at anytime for any reason. Note: This vehicle runs well, drives well, and is in great condition, but with any used vehicle minor wear may appear under close scrutiny, this includes small sand or rock chips and (or) miniscule scratches . We endeavor to deliver accurate descriptions but, please note, this is a used car, which as nice as it may be, it is not brand new. All cars are sold AS/IS unless otherwise noted. You are welcome to view , inspect, and drive any vehicle before purchasing at our Highland Park location. We are committed to selling quality vehicles and want to make sure our customers are satisfied with their purchases. We will do our best to describe any flaws or defects in our listings. Please call us or email any concerns before bidding.